Bedford director of rugby Mike Rayer is determined to end the season on a high. The Blues chief is still looking for his side to earn one more win and mathematically secure Greene King IPA championship rugby for next season. Doncaster and Nottingham are to come after Saturday’s visit of Moseley to Goldington Road, a side the Blues beat 23-15 at Billesley Common just after the turn of the year. With Kevin Maggs’ team just one place below Bedford in 11th and bottom-club Plymouth facing the difficult task of having to beat Bristol, the Blues will be seeing this weekend as an opportunity to pull away from the foot of the table. Rayer said: “It’s a big game for us on Saturday and we want to be in control of our destiny for next season. “That is exactly what our focus is on at this moment in time. “Hopefully we get the right result at the weekend and it will give us a little bit of impetus between now and the end of the season which we can hang our hats on going into next year. “We really want to get the win at the weekend but not only that a good performance and start giving ourselves a platform going into next year. 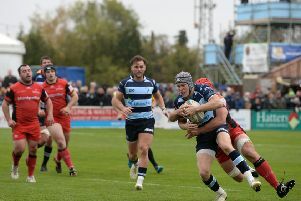 Bedford have had two weeks to prepare for the visit of Moseley after their last fixture away at Bristol ended in a 38-14 defeat, but the strong performance in the west country that day has left Rayer with a selection headache going into the Blues’ penultimate home fixture of the season. Backs Dean Adamson and Ollie Dodge both scored tries in Mobbs Memorial fixture with the Army last week but Rayer is unlikely to change much from the match day 22. He added: “Everyone apart from Ben Gulliver is in the mix. “Whether they (Adamson and Dodge) have done enough I’m not sure because the backs played well last time out, but they’re back available and that’s the most important thing.